We've seen 3D desktops with programs like BumpTop and while those programs are really cool, we've yet to see something free which adds similar effects to image viewers and organizers. Twins Visions is like BumpTop, but with features for organizing your photos in a 3D environment. 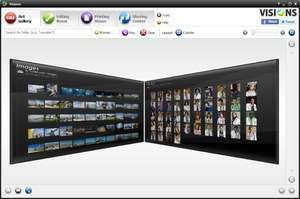 With this image viewer, you can view your photo collection as a set of boards spread across your computer screen! With it, you can perform basic image organizing functions like moving files from between folders, compare differences between images and folders or simply view your images as a 3D slideshow! Version 1.4.4.1858 is a freeware program which does not have restrictions and it's free so it doesn't cost anything. For security reasons, you should also check out the Twins Visions download at LO4D.com which includes virus and malware tests. Additional screenshots of this application download may be available, too.